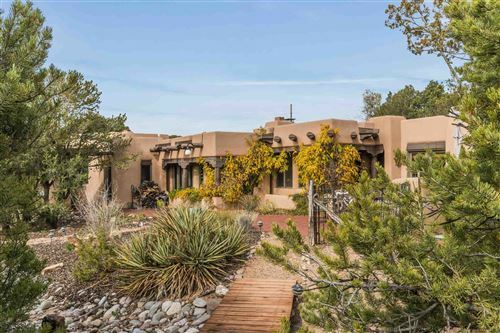 Canyon Road is an art district, in Santa Fe, New Mexico, USA, with over a hundred art galleries and studios exhibiting Native American art and antiquities, traditional and modern Hispanic art, regional contemporary art, international folk art and international contemporary art. Canyon Road had its beginnings as a residential neighborhood. Houses built in the Pueblo Revival style, in accordance with the local Hispanic and Pueblo methods were constructed withadobe walls and courtyards, often as compounds for extended family. Canyon Road is a long, narrow road that leads to the Sangre de Cristo Mountains. Artists were drawn to its beauty and began to create a subculture of artist-run studios and galleries. Over time, as Santa Fe became more of a tourist destination, Canyon Road became known to the wider world. The area hosts a "Farolito walk" open house event on Christmas Eve that can attract thousands to the area.